International Red Hockey Championship completed another fabulous and exciting weekend. 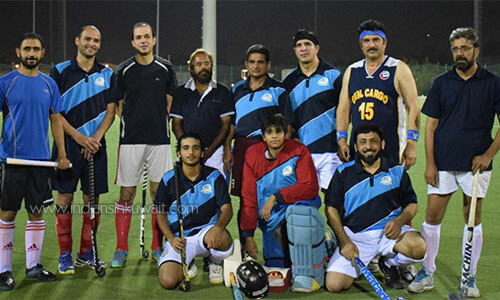 With the Summer temperatures falling the Kuwait Hockey Kings took off on a scoring spree with Naveed scoring Twice while Tanveer, Shahbaz, Asif Raza and Waleed made their mark too. For the IRH team only the Captain Frank D'cruz made it to the list of elite scorers at this Field Hockey Championship being played at the KOC Hockey Grounds, Ahmadi Park on Friday. In the other match of the day KOC Blues faced the KOC Greens in what was one of the most exciting matches of this championship. While only Harman could find the net Twice for the Greens, Shouqat Ali of the Blues scored Twice within the 1st Quarter and Mahmoud Abdulfatah ensured their 3rd straight win with a goal. Later Mahmoud Abdulfatahs brilliant 60 Yard run with the ball along the flank and a well directed pass to Hosam Jabran who with a precise deflection sealed a win to the memorable game. At this stage KOC Blues continue to remain at the top of the table with Hasnain Ali perched at the Top Scorer spot. 5th October's fixtures will see a display of skills and talents of all the Six competing teams in a single evening at the KOC Hockey Grounds, Ahmadi Park on Friday.. 5PM - KOC GREEN V/S DOMINIC SAVIO; 6PM- KUWAIT HOCKEY KINGS V/S KUWAIT INTERNATIONAL HOCKEY; and at 7PM - INTERNATIONAL RED HOCKEY V/S KOC BLUE.